What leads to this condition? How does the doctor diagnose this condition? Where does the name De Quervain come from? What is De Quervain´s syndrome? Picture an extension from the thumb to the forearm: Right in front of the wrist you would find a canal which allows passage to several tendons on their way into the thumb. Extensor tendon canals of the wrist. More specifically: Typically two tendons run inside this canal. In exceptional cases three or even four tendons were spotted. A variety of factors must be contemplated when attempting to answer this question. Many times concerned patients will report of severe pains following unusual straining (e.g. gardening work, extensive carrying of heavy objects, extensive bike or motor bike riding, intensive tennis or golf playing…). But also inflammatory or rheumatic diseases to the tendon sheath have been known to lead to De Quervain´s syndrome. De Quervain´s syndrome may also be the result of occupational risk factors. Other terms used by doctors referring to the condition are entrapment tendinitis or De Quervain´s tenosynovitis. Thickening of the first extensor compartment is a typical visible symptom associated with De Quervain´s syndrome. Typically an experienced hand surgeon will be able to recognize De Quervain´s Syndrome fairly easily. The massive thickening in the area of the first extensor compartment many times can be spotted with the bare eye. 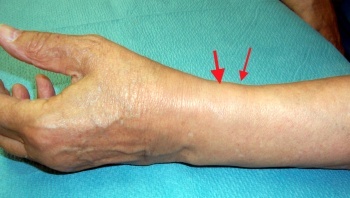 The image shows a thickened first extensor compartment. If the pain increases due to the pressure associated with this motion, and if the Finkelstein´s test shows positive results, then diagnosing De Quervain´s syndrome is a simple matter. Position of the hand during Finkelstein´s test. The image shows the execution of the Finkelstein´s test. First the patient is being asked to make a fist around the thumb after which he/she should perform an ulnar deviation (ulnar move of the wrist into the direction of the pinky). There are other conditions such as carpometacarpal osteoarthritis affecting the neighboring tissue. In these cases it may become necessary to arrange for additional exam methods such as an ultrasound or x-ray image. The image shows advanced carpometacarpal osteoarthritis (rhizarthrosis). 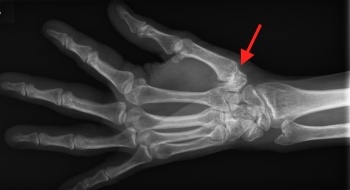 The pain associated with this pathology is very similar to the one known in connection with De Quervain´s tenosynovitis. De Quervain was a Swiss surgeon who in 1896 described the condition for the first time. The condition was named after him in honor of his achievements.